Photo right: Larry and Terry Hilliard on their wedding day back in 1999. 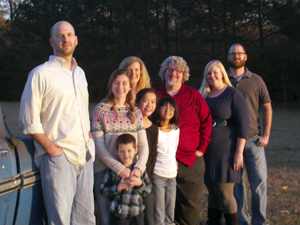 Photo below right: A recent photo of the Hilliard family. Did you know there are roughly 27 clergy couples in the Mississippi Conference of The United Methodist Church? With Valentine's Day around the corner, two Mississippi pastors are sharing their story of love, family and celebrating a combined 42 years of ministry. Meet Larry and Terry Hilliard. Terry Hilliard recalls the year being 1990 when she and a small group from the Texas and Mississippi annual conferences became friends while attending a workshop at Perkins School of Theology in Texas. She was living there, married and with three children. Three years after her divorce, she contacted one of those clergy friends named Larry from Mississippi. He responded to her letter and it wasn't long after that they began communicating regularly and dreaming of a future together. "One time we were at his parent's home and we walked around outside for about two hours saying to each other -- if I was in love, what would we do about this or that -- so, we worked everything out hypothetically before either one of us said it (I love you. )," she explained with laughter. After confirming they were in love, the time came for her children to meet Larry. "They were good from the get go. The first time he came to visit, they came in the room, stopped and struck up a conversation with him without me prompting them... the reality check came later when the bill for the meal was more than his (Larry's) plane ticket," she chuckled. "His smile, his faith, made me feel so cherished and valued... I have learned how to laugh at myself more about people and interactions. I can be more judgmental and speak more quickly, he's taught me how to sit back." "We just kind of met and became friends. We were both in difference places physically and emotionally," explained Larry Hilliard, thinking back to when he met Terry. "I still really don't know how it all happened other than I feel that God was a part of it." Larry said that he needed someone strong in his life and Terry gave him that. "Terry is able to handle conflict really well. It doesn't just reside in her; she is able to engage it, but not be drawn into to it. That is something I wish I had and desire," he said. "I highly respect Terry as pastor and I feel like she highly respects me as a pastor. If I wasn't married to her I would be happy to attend the church she is the pastor of." 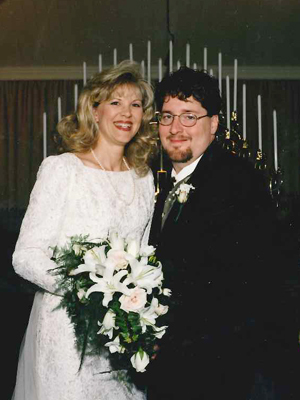 Larry and Terry married on Jan. 16, 1999. They commuted for six months before deciding that Mississippi was the best place for them to raise their family. He was thrilled that Terry would be continuing her ministry in Mississippi where their family eventually increased with three girls and a grandchild. "The Mississippi Annual Conference was good to me. I was baptized and came to love the Lord. I met my wife because they (the conference) sent me to attend a conference. The churches are helping raise my children. Teaching and helping me as a husband and father I am just so thankful." Honoring both of their calls comes with challenges. The couple agrees that their children are impacted most, especially around appointment time. For instance, saying goodbye to friends and having to make new ones. For Larry and Terry, deciding which parent's church to involve the kids is best and carving out time for school functions can be a challenging. In the end, Terry said the solution has been simple. "Gods always have been faithful. Whatever issues we were worried about have always found a way of working out," she said. Larry adds that they have been blessed to have understanding congregations and being honest with the church about their priorities has made life as a clergy couple fulfilling. He makes it clear that he is a husband, a father and a pastor. "There may be times I cut corners but that order never changes. Every church I ever served loved to hear that...I think that is our highest call from God is when we have been placed in relationship with people, to honor that relationship. Not that everybody has to be married or has to be a parent, but when God has entrusted that with you, you have to be good stewards of that." Rev. Larry Hilliard currently serves at the director of spiritual leadership for the Mississippi Annual Conference. Rev. Terry Hilliard is the pastor at Broadmeadow UMC in Jackson, MS. Both extend a Happy Valentine's Day wish to everyone.